St. Patrick’s Day is on Friday; that means Summer is just around the corner! Speedy Market has all the food you need to have a great St. Patrick’s Day party, whether you have people coming over or you are just hanging out with your family for the day. From breakfast tea to the chocolate for dessert, Speedy is your one-stop shop for St. Patrick’s Day! Every St. Patrick’s Day has to have a morning, and what better way to start the day than with a cup of Murphy’s Irish Breakfast Tea! Rich and full-bodied, this tea is imported from Ireland. Each bag of tea is foil wrapped for freshness so that your first cup is just as fresh as your last cup. There is a reason why Kerrygold Butter is Speedy’s best selling specialty butter, it is delicious and useful year round! Use it for all your baking and cooking needs, and be sure to keep it at the table for use with your favorite crunchy bread! 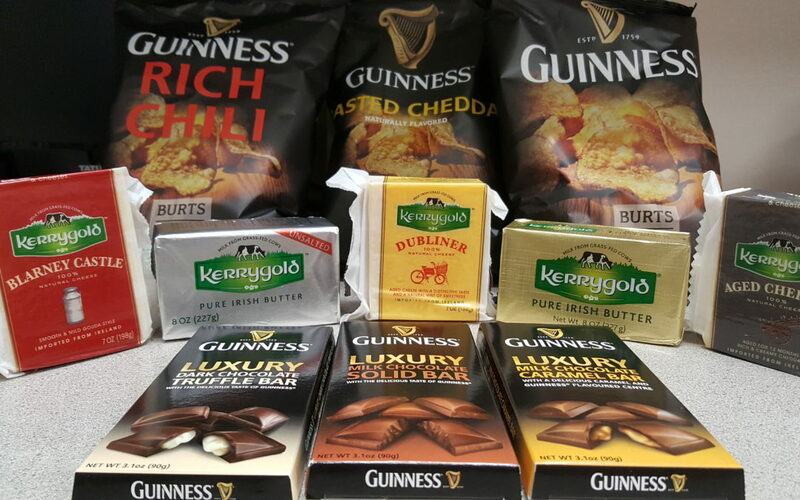 Kerrygold is also behind one of Speedy Market’s best selling specialty cheeses, Dubliner Cheese. This sweet and tangy cheddar cheese is great with crackers or any meals you may have. This cheese comes in a precut square as well as spreadable wedges. We also carry other Kerrygold cheeses: Blarney Castle, Aged Reserve Cheddar, Skellig, Reserve Cheddar, and Swiss. Like the butter, the milk used in these cheeses comes from grass-fed cows. For a healthy and protein-packed St. Patrick’s Day lunch, try some fruit, nuts, and Kerrygold cheese. Unfortunately, we do not have everything for your St. Patrick’s Day party, we do not have Guinness! (Be sure to check The Little Wine Shoppe for that!) We can have the next best thing: Guinness Potato Chips! These tasty chips made by Burt’s Crisps are imported from the UK, and come in three flavors: Original, Rich Chili, and Toasted Cheddar! What is a meal without some dessert? Speedy has you covered there with Guinness chocolate! It comes in three flavors: Dark Chocolate, Caramel, and Truffle. All three are made with real Guinness stout, and is sure to erase any doubt that beer and chocolate belong together! The beer compliments the chocolate without overwhelming the flavors. While this blog was intended to highlight some of the St. Patrick’s Day items that you may not have thought of, we have many of the classic items too. Tim has fresh corned beef briskets in the meat department, both flat and point cuts. And in the freezer, be sure to check out the frozen ground lamb to make an authentic Shepherd’s Pie! If you do not feel like cooking, Speedy Market proudly features Boar’s Head Corned Beef in out deli! Bob’s Red Mill makes an Irish Soda Bread mix as well, which will be great with some Kerrygold butter! Happy St. Patrick’s Day from all of us at Tim and Tom’s Speedy Market!